No items matching the keyword phrase "landro's pet box" were found. This could be due to the keyword phrase used, or could mean your server is unable to communicate with Ebays RSS2 Server. Landro's Pet Box is similar to the other grab bag loot item...Landro's Gift, but instead of mount loots, Landro's Pet Box contains...you guessed it...pets! Landro's Pet Box is guaranteed to contain one of the fun, limited use consumable loots, with an off-chance to contain a very special pet loot item! 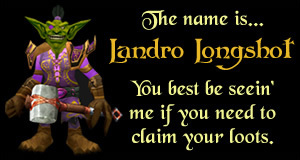 Landro's Pet Box was a turn-in reward available through the WoW TCG UDE Points Program, which was shut down back in 2010. 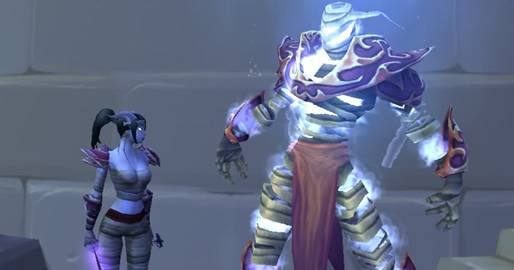 As a result, the pet box loot codes are pretty rare, but it's also important to note that even if you do find one, it's probably not worth buying. The odds of receiving a rare in-game pet by way of Landro's Pet Box are quite slim. It is estimated that the drop rate is approximately 1%. By that estimate, it would require about 100 pet boxes in order to see a rare pet. Landro's Pet Box is fun stuff, but if you want a particular pet bad enough, you're much better off just buying it from an ebay seller.